This article will help you attach files sent outside of Infusionsoft to a contact record created/updated in Infusionsoft. 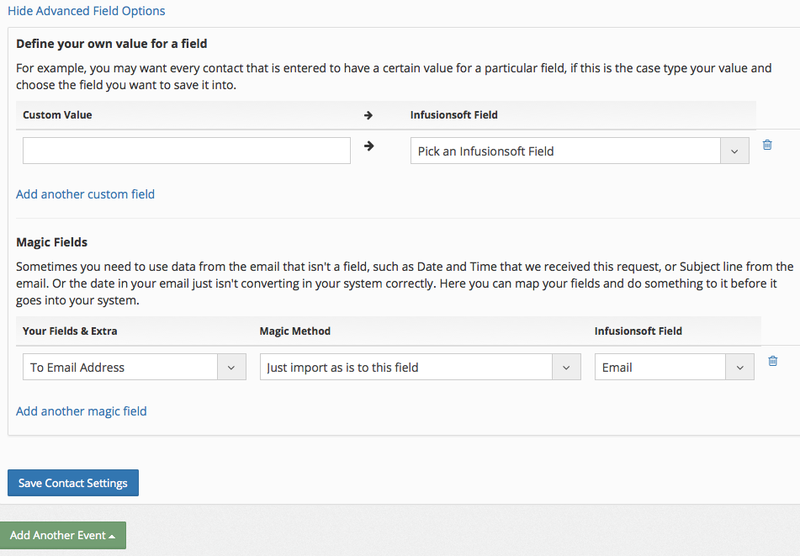 If you're BCC'ing Parsey with the intent to upload an attachment to the contact record to whom you're emailing, you'll want to expand the Advanced Field Options and configure a Magic Field. If you plan to allow all files to be attached to the contact record, simply choose 'Yes' from the 'Attach All files?' drop-down menu. If want only certain files, or know there are certain files you don't want, the choose 'No' from the 'Attach All files?' drop-down menu. In the example above, we've configured Parsey to only upload files that are pdf's. Use a combination of the first two drop down menus to create your own unique set of logic for uploading files based on Content Type, File Name or Size in bytes. AND Filters will mean the file will have to meet both statements in order to be uploaded to the file box. OR Filters will mean the file will have to meet one of the statements in order to be uploaded to the file box. Step 4: Click the 'Save' button. 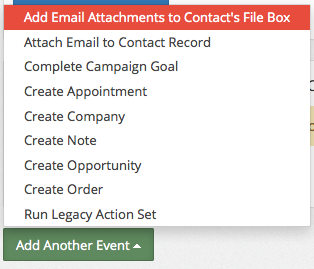 PRO TIP: Most users who configure this event, also have the 'Attach Email to Contact Record' event configured. REMEMBER: Adding email attachments to contact records only works for email parsers. If you choose this for a webhook it will do nothing.